You've got to really, really, really love sandwiches to do this. As the discount fast food wars increase in intensity, there is seemingly no end to the bizarre gimmicks chains are trying to capture consumers' attention. We've seen IHOP turn into IHOb (turns out, that really worked!) to Burger King commercials trolling McDonald's in various ways. Now Arby's is taking the fun to the next level in a slightly painful way by making sure their customers can always get a glimpse of their favorite sandwiches — basically until they die. This new promotion comes courtesy of the chain's "sandwiches for life" deal, which isn't quite what it sounds like. Instead of sandwiches you can eat, the chain is offering free tattoos of sandwiches — yes real, permanent tattoos. Arby’s is joining forces with tattoo artist Miguel "Uzi" Montgomery to give away free tattoos at 11 a.m. and 8 p.m. PST at Port City Tattoo in Long Beach, California on Saturday, Sept. 22. 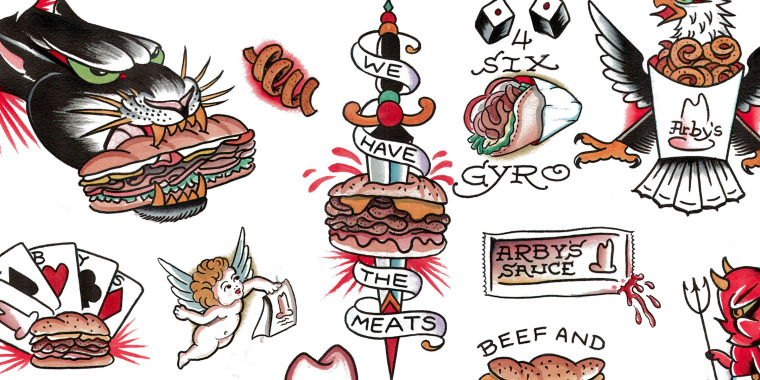 Of course, there’s a catch (well, another one): You need to choose a tattoo from a pre-drawn list of Arby’s menu items flocked by standard tattoo designs ... but, hey, those who do so get to have Arby’s by their side for life. We're not sure how many people will actually be signing up for this but for now, at least we have a few hysterical social media reactions. No tattoo artist I know would ink this sandwich flash on anyone. For anyone not (um, lucky?) enough to be in Long Beach to experience this in person, there’s also the option to download a flash sheet that can be taken to any local tattoo artist. Of course, that tat won’t be free. Those who decide to take the plunge (or go under the needle),will have a lot of fun options to choose from, including a “we have the meats”-tribute, various stacked sandwich options and even an eagle holding curly fries. How patriotic! Interestingly, a few Russian branches of Domino's Pizza did a similar promotion in August: those who agreed to get a tattoo of the Domino’s logo were offered the chance to get free pizza for life. However, the promotion proved too successful and the enrollment period was cut short when too many people got inked to take advantage of the deal. Of course, Arby’s is not giving anyone free food in relation to said tattoos. The only sandwich for life here will be inked on people’s arms, legs and, well, anywhere else they like.